"We say what we do and we do what we say"
As you can imagine every project is unique it is essential that we fully understand your requirements. We are fully flexible when it comes to arranging a survey, we will find a time to suit you weather that is early in the morning before you go to work, lunch time, late in the evening or even over the weekend. At the visit we would gain a better picture of the project and get an insight of your needs. 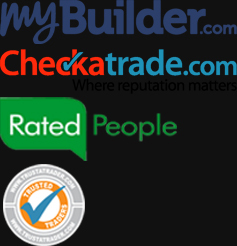 We are a well established company specialising in all aspects of general building, renovation and maintenance work. We offer a complete package, including house extensions, kitchen fitting, loft conversions, bathroom installations, flooring, tiling, underfloor heating, painting and decorating, electric, plumbing, heating, excavation, drainage, walls, driveways, patios, fencing, decking, gardens, hard landscaping and all general building work. Free advice and quotations. 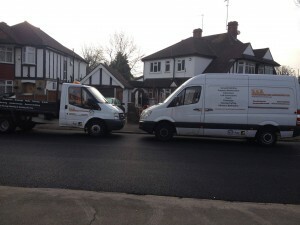 All our work is carried out by our own employed teams. Our clients are of paramount importance to us and we endeavour to make the whole experience as enjoyable as we can, keeping you informed of progress throughout your project. Our clients describe us as approachable and professional and the majority of our work is through personal recommendation. “A patio and garden paving job for my elderly mother. The work was exactly as agreed, within budget and to schedule. The quality of workmanship was high. Communication was excellent. Chris and his guys always arrived on time, worked hard and were courteous and considerate to my mother. My mother is no push over with high standards. When I asked how she would score RAS out of 10 she said “10.5”. High praise indeed. Thank-you for a trouble free experience. "This difficult job was completed to a very high standard in a timely and courteous manner. They were punctual, tidy and obliging." "I found the workmen to be very friendly, punctual, and clean. The overall work completed, was doen to a very good standard. The process of the work undertaken was conducted professionally, with a propoer written contract, milestone payments etc." These guys are pure professionals. My garden is massive and was an absolute mess ( look at pics on 8th October) Chris and his team completely transformed my garden. It took 5 weeks and they worked solidly every single day. They were a pleasure to work with, obliged to my changes in ideas for the garden.I would highly recommend them to anyone who wants a high quality job! !